The cranberries with pear puree before the sauce has been cooked. Last year I created an Orange Cranberry Sauce that used orange juice rather than sugar to sweeten the tart cranberries. It was delicious! This year, since I simply can’t make the same thing twice, I tried a something new. This Pear Cranberry Sauce won rave reviews earlier this week at my Thanksgiving Favorites nutrition class. During this class we talked about some of the challenges that the Thanksgiving meal poses and how to troubleshoot those challenges. We sampled foods that you CAN and SHOULD eat on Thanksgiving, such as this cranberry sauce, a brown rice stuffing with pistachios and dried apricots and roasted brussels sprouts. Cut pears into quarters or smaller pieces. Place in a blender with juice and piece of ginger. Puree until smooth and juicy. Place cranberries in a saucepan. Cover with pear-orange puree. Add cinnamon and cloves. 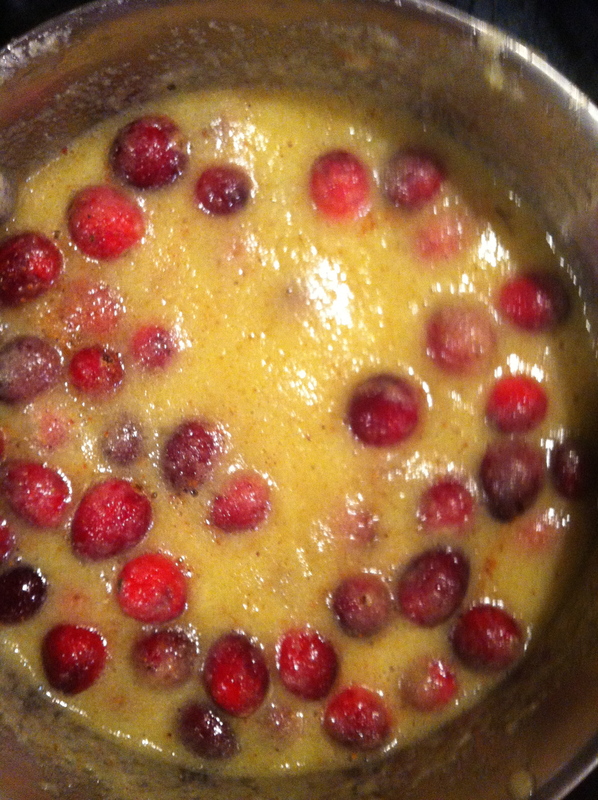 Bring to a boil, cover and then simmer until the cranberries have popped and are soft, about 30 minutes. Stir occasionally.